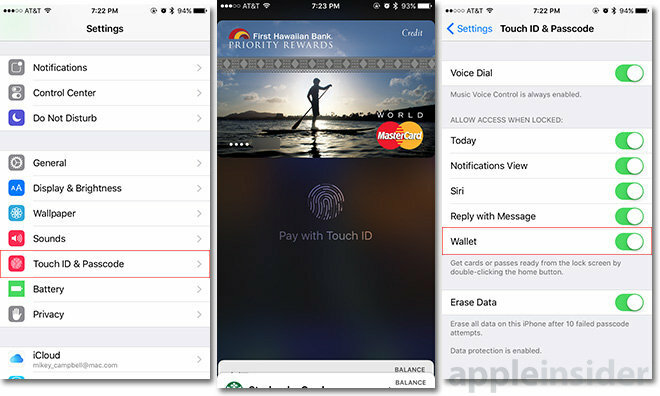 iOS 9's ability to access Wallet, née Passbook in iOS 8, from an iPhone's lock screen is a feature partially borrowed from Apple Watch. With Apple's wearable, users activate touchless NFC Apple Pay capabilities via a double-press of the power button. For iPhone 6 and 6 Plus users running iOS 8, simply bringing the device within range of a compatible and active point of sale terminal automatically invokes the Apple Pay function. Users need only to authenticate via Touch ID to complete a transaction. Apple's iOS 9 not only carries over these same automated payment functions, but add in the convenience of selecting from any number of provisioned cards without unlocking iPhone and opening the Wallet app. To turn on lock screen Wallet access, open Settings and navigate to Touch ID & Passcode. After entering your device passcode, scroll down to the menu subsection titled Allow Access When Locked: and toggle Wallet to the on position. Once activated, Wallet can be accessed directly from the lock screen by double-clicking the home button, selecting an appropriate card on screen and authenticating via Touch ID. The feature will be especially handy given newfound support for Kohl's and JCPenney special store cards. Apple Pay access to loyalty and member cards will also be available from additional select retailers.